Preheat oven to 425°. Toss squash, thyme, garlic, olive oil, and coconut oil in a large baking dish; season with kosher salt and pepper. Roast, tossing occasionally, until almost tender, approx. 40 minutes. Reduce the heat to 300 Add dates; toss to coat. Roast until squash is very tender and dates are soft, approx. 10 minutes. 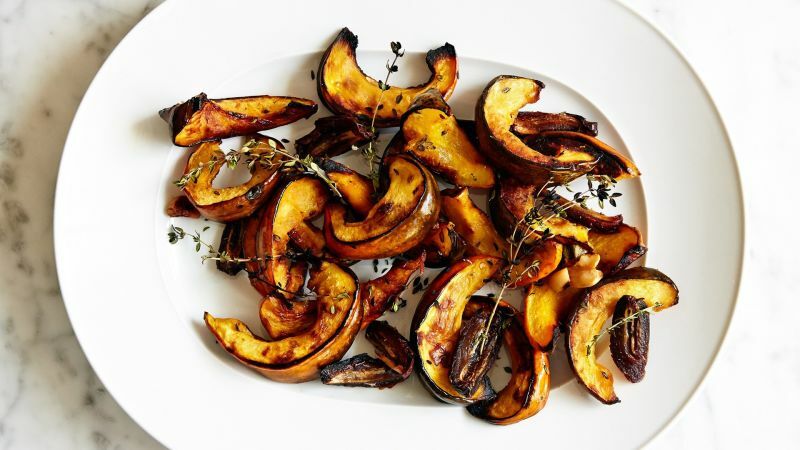 Arrange squash, dates, garlic, and thyme on a platter, spoon any oil in dish over squash and sprinkle with sea salt. you could substitute butternut squash for the acorn if you prefer.